Shea Butter is extremely beneficial to the skin - find out more! Shea Butter is a very popular ingredient within the natural body care and cosmetic industries for good reason. It has moisturising and healing properties, and is able to protect and condition damaged skin. Shea Butter is packed full of fatty acids and is naturally rich in Vitamins A, E, and F, as well as a number of other vitamins and minerals. In addition, Shea Butter offers low levels of UV protection, and is sometimes incorporated into natural sunscreen products (Note: the SPF of shea butter is low and it should never be used as a sun screen on its own). It is also a wonderful moisturiser that can be used before or after sun exposure, and helps to reduce the possibility of the skin peeling or becoming dry. So because of its soothing nature, anti-inflammatory and rejuvenating effects, it is a perfect ingredient to incorporate into your body and skin care regime. Shea butter has been used for centuries in Africa and the majority of Shea Butter we use today is still prepared by hand in small villages across western Africa. To produce Shea Butter, the nuts are first picked from the Shea Tree, then cracked, grilled, and pounded by hand. They are then boiled in water until the oil rises to the surface of the pot. This oil is then scooped into containers, where it is allowed to cool. Once the oil has cooled, it thickens into a butter-like consistency. It is a greasy feeling butter, and not everyone is a fan, but if you don’t mind an oily feel, then shea butter is a great choice! The typical composition of shea butter is 3 to 7% palmitic acid, 35 to 45% stearic acid, 40 to 55% oleic acid and 3 to 8% linoleic acid. As well as all these saturated fatty acids we get a host of vitamins, minerals and antioxidants. The oleic acid in shea butter, which is typically 40% to 55%, offers moisturising, regenerating, anti‐inflammatory, and softening properties and is absorbed well by the skin. Stearic acid, which is typically 35% to 45%, offers improved moisture retention, flexibility of the skin, and skin repair. Shea butter contains large amounts of Vitamin E in the form of tocopherol (100 to 150 ppm) and tocotrienols (110 to 175 ppm), which act as natural anti-oxidants. It also contains at least 8 various catechin compounds, which offer anti-bacterial properties. The phytosterols in shea butter contain cinnamic acid esters, which can act as a UV protectant. 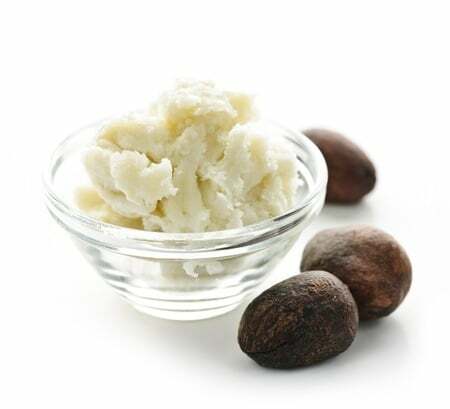 These esters also offer some of the healing properties associated with shea butter by helping to reduce superficial irritation and redness of the skin. Shea butter also contains allantoin, which acts as a barrier ingredient to temporarily prevent and protect chafed, chapped, cracked, or windburned skin by speeding up the natural processes of the skin and increasing the water content. Shea butter melts at body temperature and is absorbed relatively quickly by the skin. It acts as a barrier to keep water in and prevent the elements from destroying our skin! So, which ingredients contribute to the amazing qualities attributed to shea butter? • Reducing redness: Cinnamic acid esters. • Protecting skin: Allantoin, mechanism of occlusion. • Regenerating cells: Allantoin, oleic fatty acid, stearic fatty acid. • Moisturizing skin: Mechanism of occlusive, polyphenols, oleic fatty acid, stearic fatty acid. • Softening: Polyphenols (tocopherols and tocotrienols), oleic fatty acid. • Irritation: Cinnamic acid esters. • Flexibility of the skin: Stearic fatty acid. At Soapy skin Ltd we use shea butter in all our holistic soaps, so look for shea butter in your next skincare product and you too can benefit from these amazing properties.